The Long Look East End Tennis Club kicked off its fall program with a fun day on Sept 8 and will run on Tuesday’s and Thursdays through the school year. The program runs from 4-5:30 p.m.
Players ranged from five and up. Mitchell said there has been an increase in the number of new participants joining the program. She said likes the fact that they all want to play Tennis, which is a plus. Among the plans Mitchell noted is to have a tournament in February as well as participate in a Youth Tournament in St. Thomas followed by a tournament in St. Lucia in April. “I would like to thank Grace Coconut Water and Highland Spring for partnering with us in sponsoring this program,” Mitchell said. 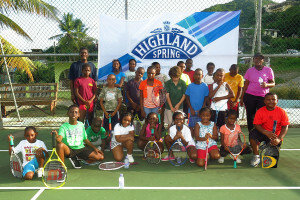 “The sport is growing and we would like to see it growing more in the BVI.